The name “Papillon” is French for “butterfly”. This tiny toy breed is so named because of the distinctive butterfly shaped head, and typically symmetrical markings on the face. 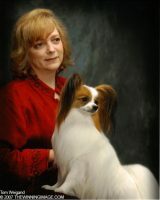 Descended from toy spaniels, this breed has been around since as far back as the 16th century. Today, they are a favorite among toy breed enthusiasts and have big, spirited personalities that belay their small size. Papillons are usually between 8 and 11 inches high at the shoulder and weigh between 4 and 9 lbs. Their tiny stature makes them perfect indoor dogs that do not require excessive outdoor exercise. They are high spirited, however and do like to have space to run and play. In the house, they may be prone to climbing on furniture during playtime, and although they are relatively sturdy for their size, younger dogs and puppies are prone to break a limb if they climb and leap off of a perch. Help guard against this by discouraging climbing on the furniture from a young age, or having pet stairs available for them to reach their favorite places! 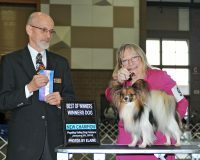 The Papillon has a long haired coat that is typically fine, silky and straight. This makes it an impressive sight when groomed well, although they only need brushed once or twice weekly to keep their coat healthy. 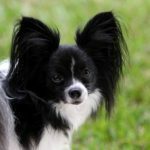 Papillons come in a variety of colors, but for the most part their faces have a white muzzle and a white patch or stripe down the center of the face, with a colorful mask around the cheeks, eyes and over the ears. Their coats can have blotches of color or spots in various patterns and hues from shoulders to tail. Colors include white, black and white, fawn, sable and brown. Some individuals can even have more than one color in patches on the back, tail, or on the face or ears. 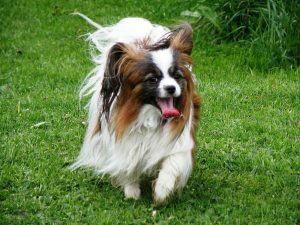 Papillons are wonderful family dogs, but sometimes very small children and very small dogs are not an ideal combination. 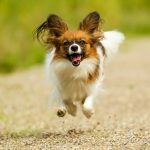 The Papillon is not naturally aggressive, but young hands that pull or pinch or are unable to hold the dog correctly can prompt it to defend itself if it feels threatened, or accidentally sustain an injury if trying to jump out of someone’s arms. Typically, however, this breed loves people and loves attention. It is a playful family member and packs a lot of personality into a very small package. They are often compared to mountain goats for their propensity to climb on furniture in the house, and they love a good soft toy or gentle game of tug. Although they do love to run and play, it’s always important to be aware of their small stature so that playtime does not get too rough and result in accidental injury. This breed is very intelligent and self-assured. They are not typically shy and they love to learn new tricks. All of that brain power also means that mental stimulation is essential to their healthy development and lifestyle. A bored dog can easily become a destructive one with bad behavioral habits. Keep lots of toys and activities accessible so there is always something fun to do! As with all dogs, finding a good breeder is essential and obtaining health clearances for your new puppy’s parents will help minimize the chance that a hereditary disease could be in the bloodline. Although they are typically a healthy breed, they can be prone to some specific illnesses. Pateller Luxation, for example, is common with many small dogs. It is a condition they can be born with, but does not become apparent until the dog is older. Pateller Luxation is a misalignment of the patella and can be severe enough to require surgical treatment. 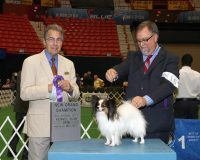 Hypoglycemia, or low blood sugar, is also a common problem with toy breeds. Small dogs do not always have the fat reserves to regulate their blood sugar, so before you bring a toy breed into your home, it’s important to know the signs of this condition. Slowing down, listlessness, trembling and shivering are all common signs to watch out for. Overall, this is a wonderful little dog to add to the household and brings joy to just about anyone he/she meets! They are beautiful to look at, a loving companion that is as happy curling up on the couch with you to relax as it is going for a walk around the block or playing inside on a rainy day. They are affectionate and loving, spunky and fun and will steal the show wherever they are!